Tottenham have played down a reported interest in Lokomotiv Moscow captain Dmitry Loskov. BBC Sport understands that Spurs have made enquiries about the attacking midfielder, who is also a regular Russian international. But Spurs have told this website they have had no formal contact with the 29-year-old star. Loskov has also refused to comment, but the player is believed to have attracted interest from Tottenham. But Lokomotiv manager Yuri Syomin told popular Russian news website Gazeta.ru that Spurs had made enquiries about the player. "I can confirm that Tottenham are interested in Dmitry Loskov," he said. "It's not surprising that our player attracted the attention of the Europe's leading clubs." Russian media has widely reported that Tottenham chairman Daniel Levy is targeting a player from Eastern Europe. If Tottenham were to make a move for the player, it would cost them in the region of £2.1m. Loskov - who has nine Russian caps - is one of the best midfielders in the Russian domestic league. 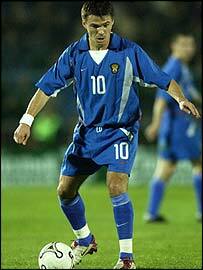 He was voted Russia's player of the year in 2002. He joined Lokomotiv Moscow in 1997 and led the team to the Uefa cup semi-final in 1998. He has also won two Russian Cups (2000 and 2001), the Russian league title in 2002 and became the leading goalscorer of the domestic league in 2000. Meanwhile, Lokomotiv Moscow goalkeeper Sergei Ovchinnikov has been linked with a move to Arsenal.